Mankini season may be over, but that’s no reason to let your fitness regimen go the way of your fashion sense. 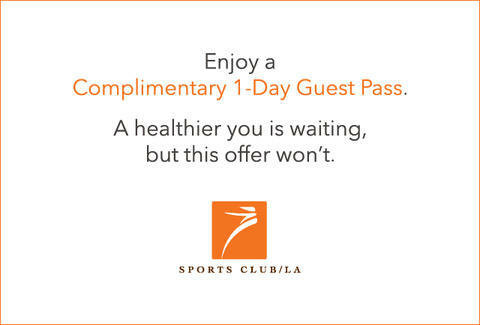 Fortunately, Sports Club/LA’s got you covered, with two exclusive opportunities to familiarize yourself with their facilities at absolutely no charge. First up, the one-day pass grants gratis access to their state-of-the-art amenities and equipment, including extensive cardio & weight-training, a full-service spa, in-house nutrition counseling, luxurious locker rooms, and more. Better yet, join by Friday, November 30th, and they’ll waive the initiation fee and all dues until January 2013 -- or indefinitely if that whole Mayan apocalypse thing comes to pass. Take full advantage, and you’ll have joined one of DC’s premier fitness facilities and saved your funds -- making you as brilliant as the glare off your upper thighs when mankini season rolls around again.